Don't get your heart set on the shrimp meal. Chicago newcomer and blogger Gwynedd Stuart loves to eat out, but she also happens to be a poor person because she's a Chicago newcomer and a blogger. In this weekly feature she seeks out affordable midday meals that don't exceed five bucks (*actually seven, with tax and tip). A thing this part of the country is not necessarily known for: affordable, fresh seafood. Emphasis on affordable. OK, fine. Emphasis on fresh, too. So I was encouraged when I heard people rave about the food at Snappy's Shrimp House in North Center. "Know the difference, taste the difference," their motto goes, the difference being that Snappy's serves only Gulf shrimp, not the flavorless, dinky farm-raised kind. And that's great. But I'm spoiled. Few things make me wax nostalgic for my northeast Florida upbringing (not even the weather—although ask me again in February or March, nyuck nyuck). Fresh-caught seafood is one of those things. You can't swing a toothless redneck by his ankles without hitting a dozen roadside stands or dumpy plywood shacks selling shrimp and fish that came off a boat just hours ago and out of the ocean just a couple hours before that. I brought a couple fellow former Floridians to Snappy's on a recent Saturday and none of us were overwhelmed—they're spoiled too—but fried foods are fun and we agreed, for the most part, that we were consuming perfectly enjoyable fried foods at a good price. All their items are sold by weight, a la carte; they increase in price in quarter-pound increments. Add $2.50, and you get fries, coleslaw, and a soda. 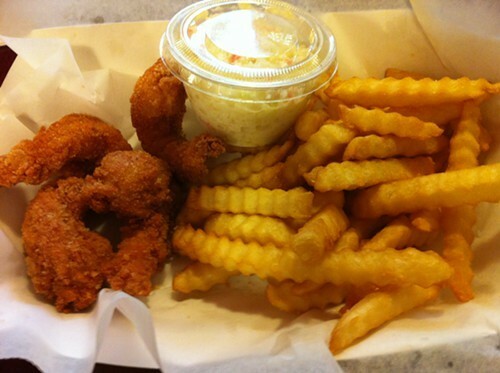 A quarter pound of fried shrimp will set you back $4.60. So the bad news is, you're not getting fries, coleslaw, and a drink and making a $5 lunch out of it. Sorry. The other bad news is that a quarter pound of shrimp is only four shrimp. Oh my God, wait, don't leave. There is also good news! And it's that the shrimp are really big and flavorful. Plus, sides of coleslaw, potato salad, and rice are only $1 each, so you can make a light $5 lunch out of it. Light is probably the wrong word for a fried seafood lunch, especially because Snappy's breading is dense. Not in a bad way—in fact, it's crunchy and pleasantly ungreasy (is there a word for ungreasy that isn't "dry," I wonder?). Even without the thick layer of crust, the shrimp are nice and big, and I actually found myself peeling off the breading so I could enjoy the simple, sweet taste and seafood snap of the shrimp themselves. Since everything was cheap, we really went for it and also got a quarter pound of the fried catfish strips ($2.50), a quarter pound of the fish chips ($2.25—and really, they were more like fish nuggets), a side of clam strips ($2.25), and an order of hush puppies (10 for $2, and they come with honey butter). I initially had trouble figuring out which were the catfish strips and which were the fish "chips," which I guess counts as a compliment to the catfish, which can tend to have that unpleasant, bottom-fed flavor. Both were breaded in the same heavy breading as the shrimp. The guy behind the counter—who'd previously told another customer he "wasn't sure" what kind of fish the sandwich was made from—said the fish chips were Alaskan pollock. So, definitely frozen. But like I said, I'm spoiled. Snappy's Shrimp House, 1901 W. Irving Park Road, 773-244-1008.